Shortly before starting our catering business in the 6th grade, Alex and I cooked our first multi course dinner. It was for our parents and siblings and our family friend Norma at my house in a suburb of Boston on a Saturday night circa 2003. 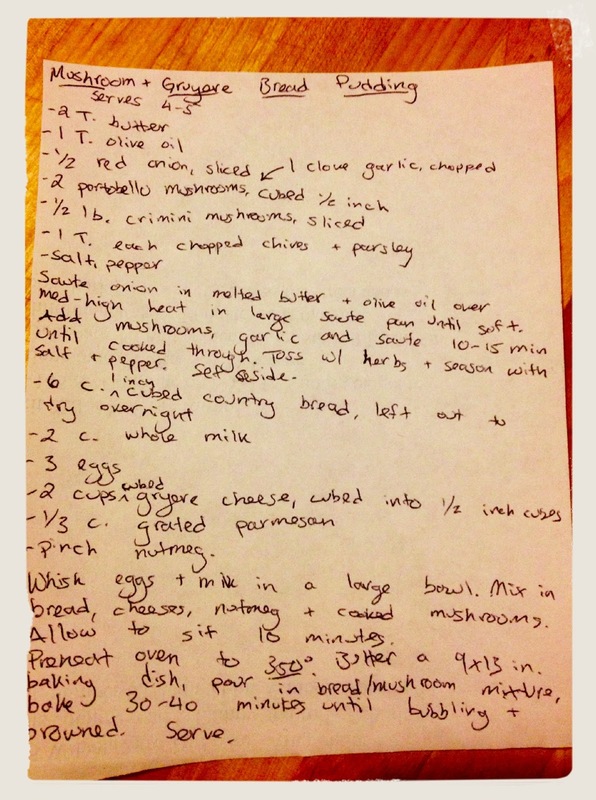 We'd scrabbled together a shopping list, had our parents drive us to the supermarket and spent the better part of a short winter day cooking and prepping until the sun went down and our siblings were crying out on behalf of their hunger. With our middle school hands we set the table, dimmed the lighting and served each course to our "guests" - the time between each course growing and growing as we further delved into confusion and chaos in the kitchen with the progression of the meal, the sink stacked higher and higher with dishes and the counter space shrinking with each new dish. There was, to begin, a curried butternut squash soup flecked with grated cheddar, which we'd made before. By the time our families got through as much of the thick soup as they could handle, their bowls sat empty as we scrambled to get the next course to the table -- roast cod with mashed potatoes from The Black Dog Cookbook (yes, of the clothing company from Martha's Vineyard). Pillows of well cooked potato sat side by side with not-as-well cooked cod, the fish flaking and dry and riddled by a doused in lemon and salt. Our generous families did the best they could to enjoy our creation. Next, another fish course (why, I don't know) of roasted salmon and asparagus from my mother's Cooking Light. This course was more bearable - the salmon well cooked and arranged artfully on top of the asparagus. Not bad. By the time everyone had finished what was an adventurous and drawn out process, we weren't about to let anyone move an inch, because dessert was still in the oven. Another standby from the The Black Dog Cookbook, the blueberry bread pudding with lemon sauce was our grand finale. Rich with cream and eggs, challah bread, blueberries and a thick lemon sauce, we had high hopes. Pulling the bread pudding from the oven, it steamed and bubbled and puffed and sagged all at once. We delicately spooned servings onto small plates and drizzled over the lemon sauce. Alex and I finally joined everyone at the table for dessert, and we all took a bite at once. The bread pudding was soft and spoonable, sweet and sticky and succulent. The cubes of challah were rich and eggy and melted like custard on the tongue. We'd struck baker's gold with pure luck. And we'd been introduced to the pleasures of sharing food with others -- our first meal of many, many more to come. Peter Reinhart, a world renowned bread baker and theologian, often shares a fact when he gives talks on baking. It's a simple fact, but it carries a round and simple message that pleases me. I last heard it at our LongHouse Food Revival in South Carolina this past winter. "The word companion," he said, "comes from the latin com, meaning with, and panis, meaning bread. Which is to say that a companion -- a friend -- is quite literally someone with whom we break bread." Many years after my first bread pudding and my first foray into the world of "breaking bread," I still seek out what that first meal brought me, in a slightly different context. I live in a big city, in Brooklyn, on the top and fourth floor of a walk-up in an anonymous building on a long and busy street in an city that, on some nights, seems endless and disappears only somewhere far beyond the horizon. In that apartment, the kitchen can become the axis of my little spinning planet. With the city stretching its arms out around me, my life zooms in on the boiling of water and the chopping of onions and the adjusting of the stove's flame beneath the saute pan. The people at my table become the only sights around me, the only sounds their voices and the loud clanking the oven makes every few seconds as it heats up. Some things are more grown up, I've bought the groceries on my own, there is beer and wine at the table and there are no parents or siblings. But mostly it is the same. And sometimes, I still make bread pudding. 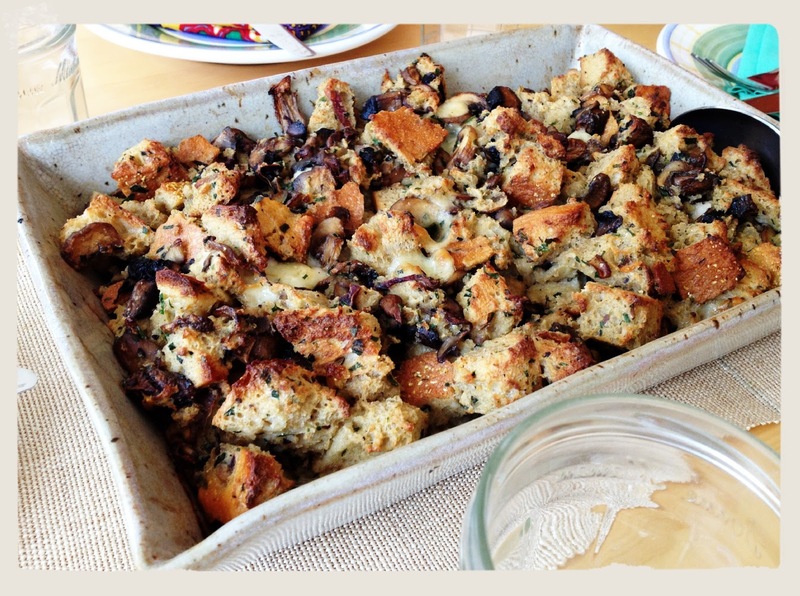 Below is a recipe I made recently that that is a far shot from my first bread pudding but that -- I promise you -- is so damn good it will have you breaking bread with everyone you know. It's a grown up version, savory instead of sweet. 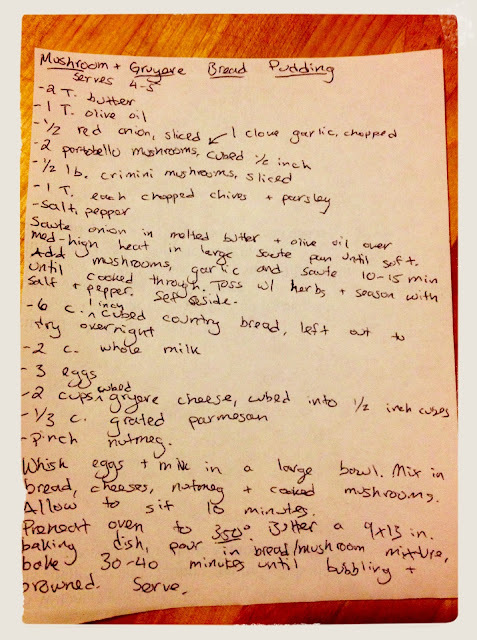 I usually don't write up recipes any more, but for this I made an exception. Because, as often is the case, some things are better left shared. 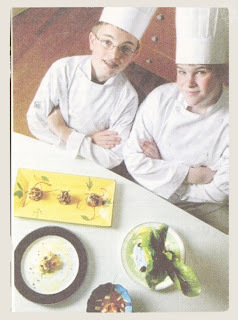 I love the photo of the two young chefs! Your menu sounds fabulous. Even today that I am rather comfortable in the kitchen, I don't think I'd prepare two fish courses. I also have a sweet spot for bread pudding, for a different reason. I like your savory version.